The Hilton Garden Inn consists of a five stories with 136 rooms, as well as approximately 6,000 square feet of conference space. It is the first hotel in Sioux Falls to offer underground parking to guests. It is also the first hotel in nearly twenty years to be built in downtown Sioux Falls. 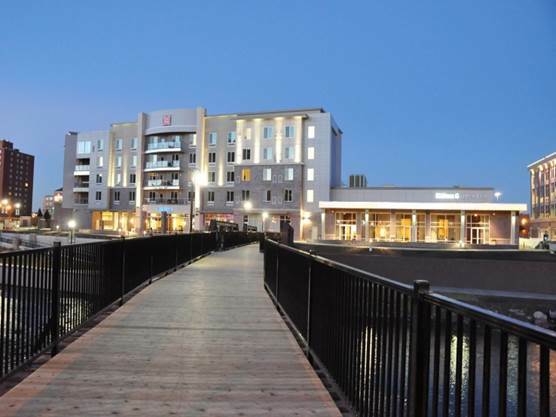 Construction was completed in the fall of 2013 and the hotel opened for business late 2013. The hotel is well positioned on the east bank of the Big Sioux River, with 8th Street bordering to the north and the newly built Lumber Exchange building to the south, home to CNA Surety, Lloyd Companies, Lindquist & Vennum Law Firm, Ernst Capital Group, and the Sanford Health Foundation, among others.